It happens sometimes. How you deal with it is the real issue! Click here to tell us what you did when your "friend" got ugly! What should you do when your “friends” get ugly? I don’t mean physically, over time, with age...I mean, if they do something (or many things) bad, or mean, to you, that you didn’t think they were capable of doing. Although there were times when it happened in the past (wherein a "friend" was ugly to me), it happened to me again recently, and it caught me off guard. Without getting too detailed, since this person is STILL my friend, and I know that s/he (keeping the anonymity) doesn’t read these articles (so you know it isn’t you), we were spending some time together and s/he started saying things that were hurtful and cruel. At first, I thought it was some idle teasing, but as the time went on, even though s/he may have THOUGHT it was all in fun, it made me think that this is not a person I want to associate with! In fact, there had been an opportunity, where s/he could have lifted my spirits and show that s/he was happy for me, but instead s/he tore me down. It got to me. Now, I’m sure this kind of thing has happened to everybody...so the question is, what do you do about it? Three Things You Can Do If Your "Friend" Gets Ugly! This step is what I am planning on doing in the above situation. Maybe my friend was having a bad day him/herself and didn’t realize how hurtful s/he was being. I have known this person for many-a-year and I had never seen this side of him/her before, so maybe it was a fluke. I am not even going to mention it to him/her just in case it WAS a fluke...and it might make things awkward between us. I know that you think it is awkward NOW, but it isn’t if I do both of the above “F” words...forgive AND forget! If it DOES happen again...I will probably remember, and then I’ll do step #2. There are probably times when your friend does something that drives you nuts, and you just say to yourself, “that’s who s/he is, and I love them just the way they are.” But there ARE times when you need to tell them what is bugging you. If it is something that you feel is driving a wedge into your friendship. If you CHERISH your friendship, you will tell them. When I was a growing up...as a pre-teen, I had some tight-knit friends! We did everything together. It started like the movie “The Sandlot.” That movie is about me. I was the kid who didn’t know, at first, a lot about baseball. I was the kid who had the cheap, second-rate, plastic baseball mitt. And I was the kid who, during a neighborhood baseball game, caught a fly ball that was hit to me to save the game and then everybody accepted me. Still, through it all, I was the one that they picked on all the time. And because I wanted to be accepted by my peers, I kept forgiving and forgetting. When we were in our early teens, however, they started teasing me at an ever increasing rate. I mean they got to the point where they were merciless. I would go home bawling my eyes out at the end of the day...and I know my parents were worried. In fact, one time my mom told me that I should tell them how they were making me feel. I thought if I did that, I might lose them as friends. Anyway, one day it got to the point where I had enough and I told them how much it hurt me and I would like them to stop. I tried the “forgive, confront and communicate” approach, and even though this step has worked for me since then in other friendships, it didn’t make a difference to them until I reached for step #3. After a while, I just stopped hanging out with the “friends.” There WAS one point when they realized they had gone too far and they told me they wouldn’t ever tease me again. I forgave them, and I even hung out with them a few more times, but the trust was gone and it never came back. I know that they were sorry, but they didn’t really try to earn the trust back either. It hurt me. I missed the good times I had had with them, but when my “friends” got ugly, I had to walk away and stay away. What a lesson for a young teenager to have to learn, right? You might have noticed that all three steps included forgiveness. Don’t ever let resentment and bitterness, or a grudge, or a desire for revenge take over your soul. It is NOT worth it. Why would you lower yourself to “their” standards anyway? I KNOW that, whichever step you decide to do when your “friend(s)” get ugly, you must remember that they have had times in their lives when someone was “ugly” to them, so it could be unintentional. But no matter what, you must ALWAYS forgive! Sometimes it hurts for a while, but if you truly forgive and get to the place where you have moved on - with amazing new friends who don’t harm or belittle you - you will be happy and peaceful, and you won’t have to hang out with “ugly” anymore! 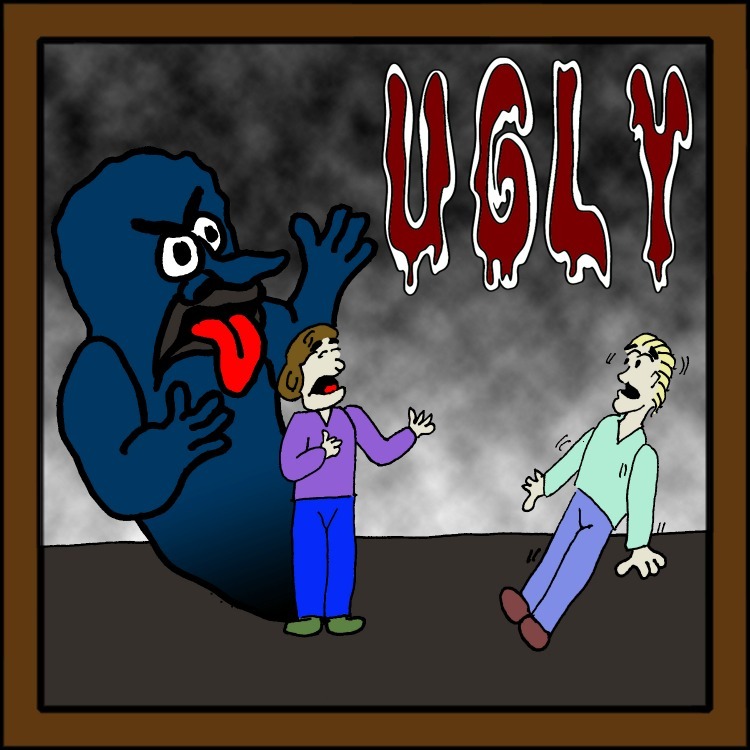 Add YOUR "Ugly" Story Here! What did YOU do when your "friend(s)" got ugly? Did you follow one of the 3 steps when your "friend" was ugly to you? Please share it with us! Give a Title to Your Story (if you wish).